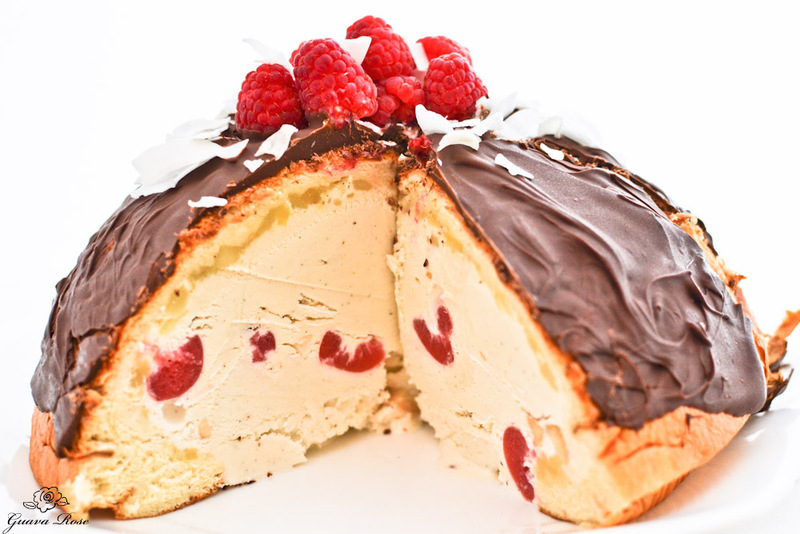 I was thinking about British Christmas Puddings one day recently, when I got the idea of making a Christmas Ice Cream Bombe instead. 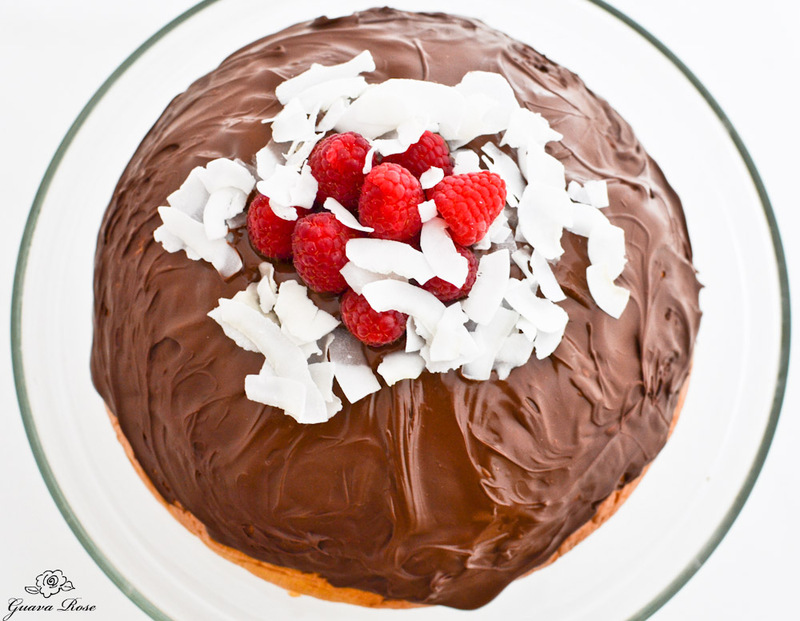 To make it extra easy and yummy, I used King’s Hawaiian Sweet Round Bread. Like so many households in Hawaii, these rounds were practically a staple in mine. Cut into wedges, and spread with butter, it was a perfect anytime food. You can buy the rounds online from King’s Hawaiian, but I was surprised that the rounds are a little difficult to find in the local grocery stores now. 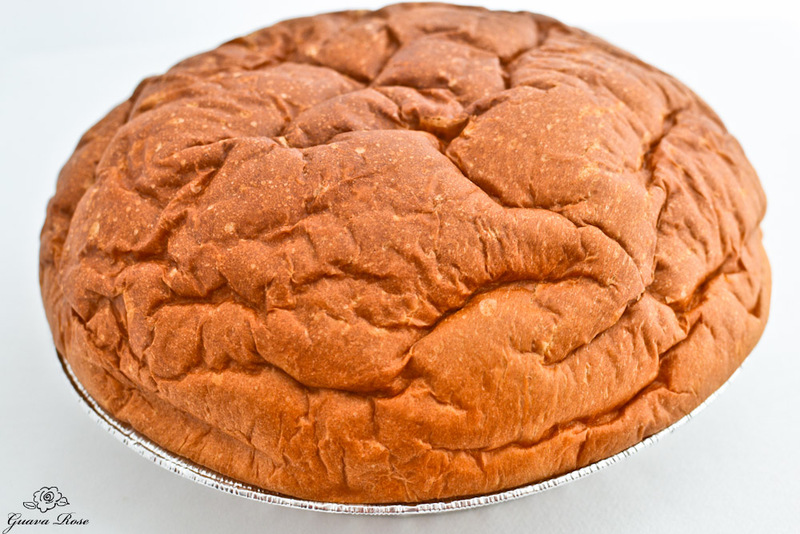 Most grocery stores only carry the King’s Hawaiian sweet rolls, sliced sweet bread, and sandwich buns. The King’s Hawaiian website does have a handy product locator to help though. Since inventories change frequently, I would call any of the locations listed just to make sure they have it in stock, and possibly save yourself a trip. I was pleasantly surprised to find it at a store not listed, but at one of my favorite stores, Oto’s Marketplace— the best place here to find all kinds of foods from Hawaii. 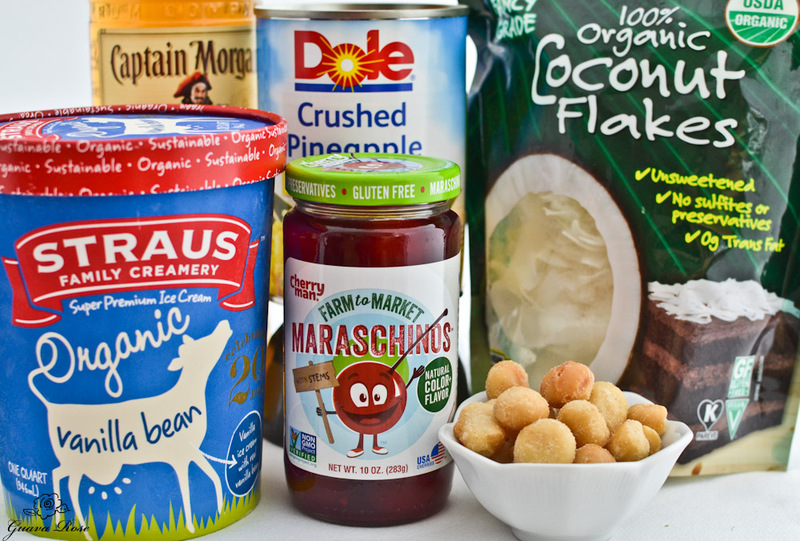 Fill up the center with a few simple ingredients: vanilla ice cream, crushed pineapple jam, marachino cherries (dye free if possible), toasted macadamia nuts, coconut flakes, and of course a bit of spiced rum. You can leave out the rum, but oh how good it is in this! First make the jam. Mix 1 c. undrained crushed pineapple with 1/3 c. sugar in a small saucepan. Bring to a boil on high, then lower heat to medium high. Cook and stir about 8-10 minutes, or until most of the liquid has evaporated. Place into a bowl and set aside to cool. Toast the macadamia nuts at 350 degrees for 3-5 minutes. 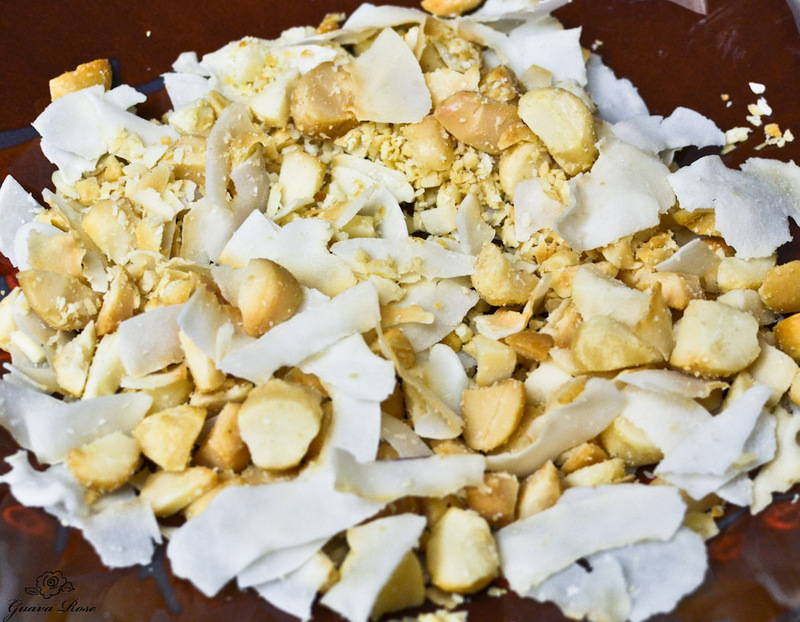 Toast the coconut flakes if you like too, but watch those closely so they don’t burn. Set them aside to cool. Turn the round of sweet bread upside down. Use a sharp paring knife to cut a circle shape into the bottom, about 1/2″ in from the edge, and about two thirds down in depth. Now cut the circle you just cut, into quarters, then use your hands to start pulling out chunks of the bread to hollow out the bread round. Leave the walls about 1-1/2″ thick all around. Criss cross and center three long layers of plastic into a 2.5 Liter mixing bowl. Place the prepared sweet bread round, cut out side up, into the lined bowl. Push the bread down so the fit is snug. 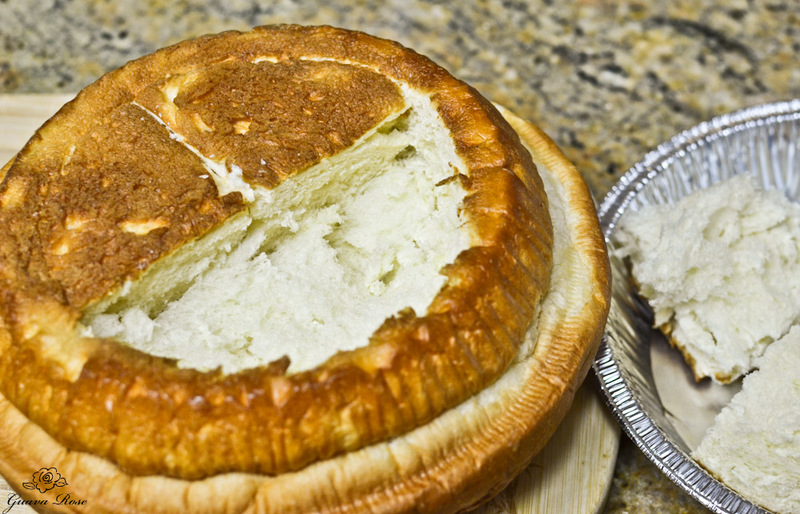 Brush the inside of the bread bowl with the spiced rum. Spread the pineapple jam on the bottom and all along the side walls. 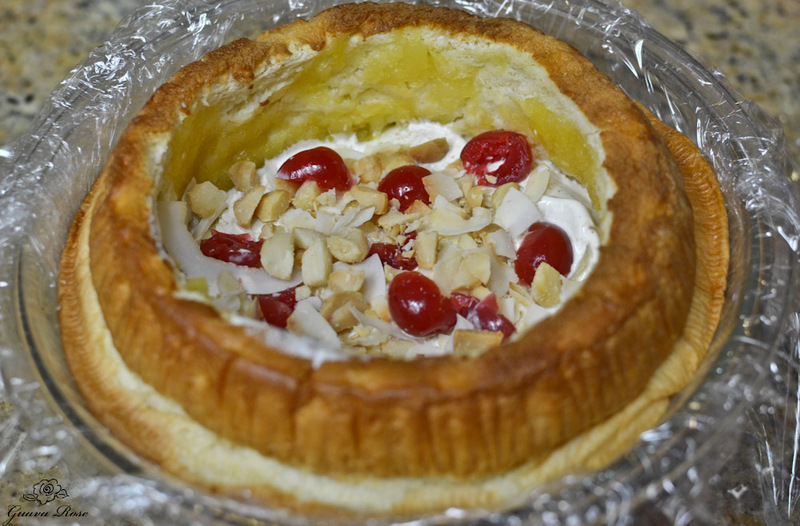 Layer and pack the bowl in this order: 2 c. vanilla ice cream; 1/4 c. each of macadamia nuts, coconut flakes and cherries; 2 c. vanilla ice cream; remaining macadamia nuts, coconut flakes and cherries; 2 c. ice cream. Smooth the ice cream over on top while packing the ice cream down well. 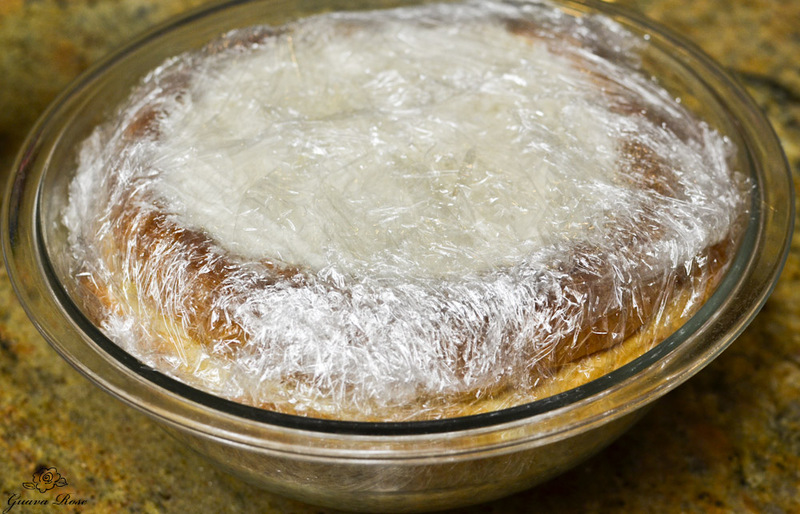 Bring the all the edges of the plastic wrap up and over the top to cover the bombe tightly. Place a plate with weights on top of the bombe in the bowl to help compress the bombe. Here I just used some ice packs, but you could use any frozen food you happen to have in the freezer. Let it freeze several hours or overnight. 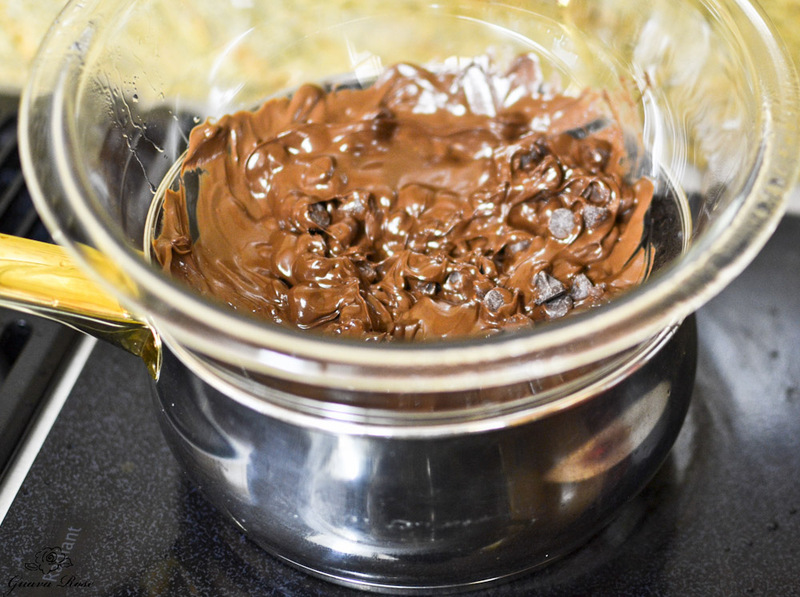 Before serving, melt semi-sweet chocolate chips in a double boiler or in a bowl over simmering water (do not let the water touch the bottom of the bowl). Be careful not to get any water or steam into the chocolate or it will seize up. Remove the bombe from the freezer and out of the plastic wrap. Place the bombe, flat side down onto a serving plate. 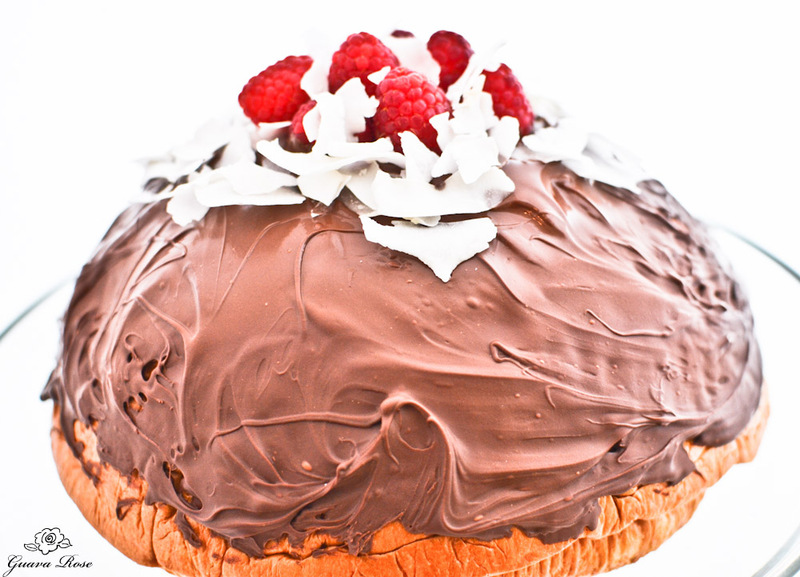 Pour the melted chocolate over the top of the bombe. Use a rubber spatula to swirl the chocolate all over the top and sides. Work quickly as the chocolate will start to harden upon contact. 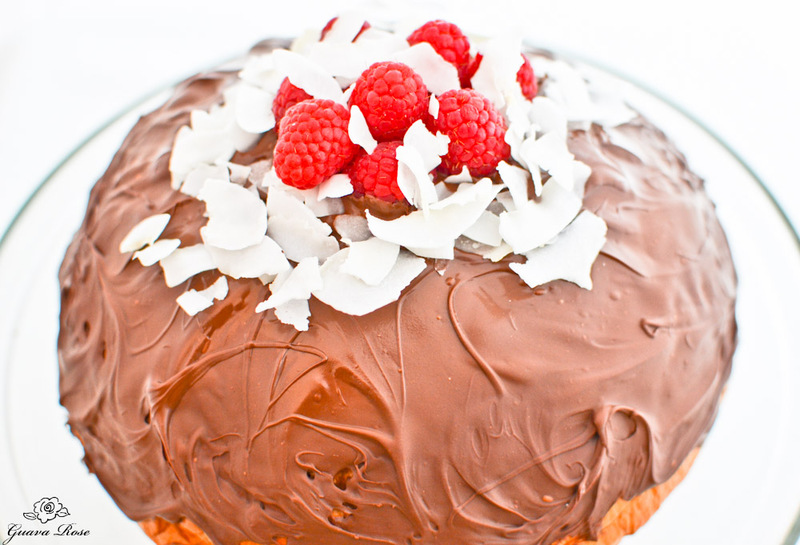 Garnish the top with a few berries or cherries, and some coconut flakes. The chocolate under the toppings takes the longest to harden up, so stick the bombe back in to freezer for 10-20 minutes to harden up the top. Hey, looks like the snow capped summit of Mauna Kea! Yes it does snow in Hawaii! Let the bombe sit out at room temperature for 10 minutes or so before serving, to soften the ice cream a bit and make it easier to cut. Use a sharp knife to cut into wedges. This is a pretty good size, so I like to cut the bombe into 16 wedges. 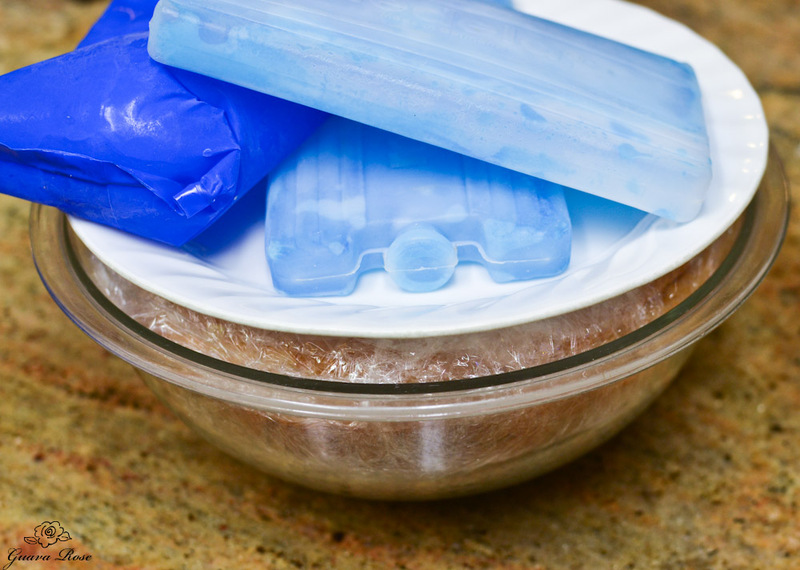 Cover up any leftovers on the plate tightly back in the plastic wrap, or place individual pieces in ziplock baggies. The pieces keep well in the freezer, but will probably disappear quickly. First make the jam. 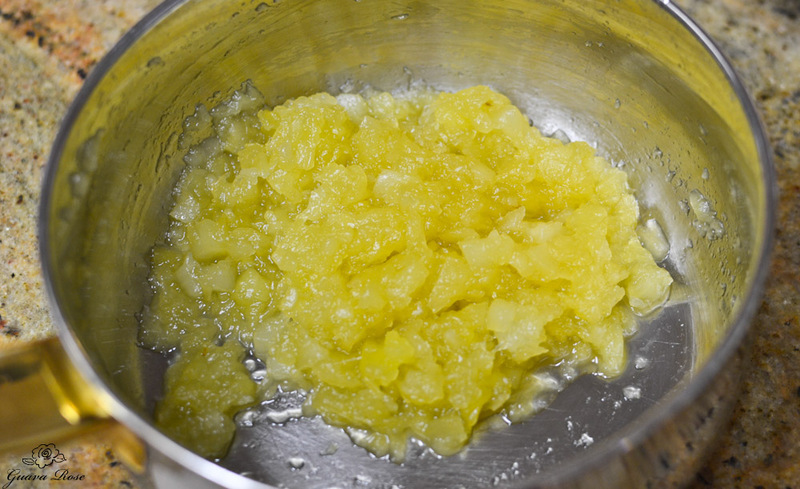 Mix 1 c. undrained crushed pineapple with ⅓ c. sugar in a small saucepan. Bring to a boil on high, then lower heat to medium high. Cook and stir about 8-10 minutes, or until most of the liquid has evaporated. Place into a bowl and set aside to cool. Turn the round of sweet bread upside down. Use a sharp paring knife to cut a circle shape into the bottom, about ½" in from the edge, and about two thirds down in depth. Now cut the circle you just cut, into quarters. Use your hands to start pulling out chunks of the bread to hollow out the bread round. Leave the walls about 1-1/2" thick all around. 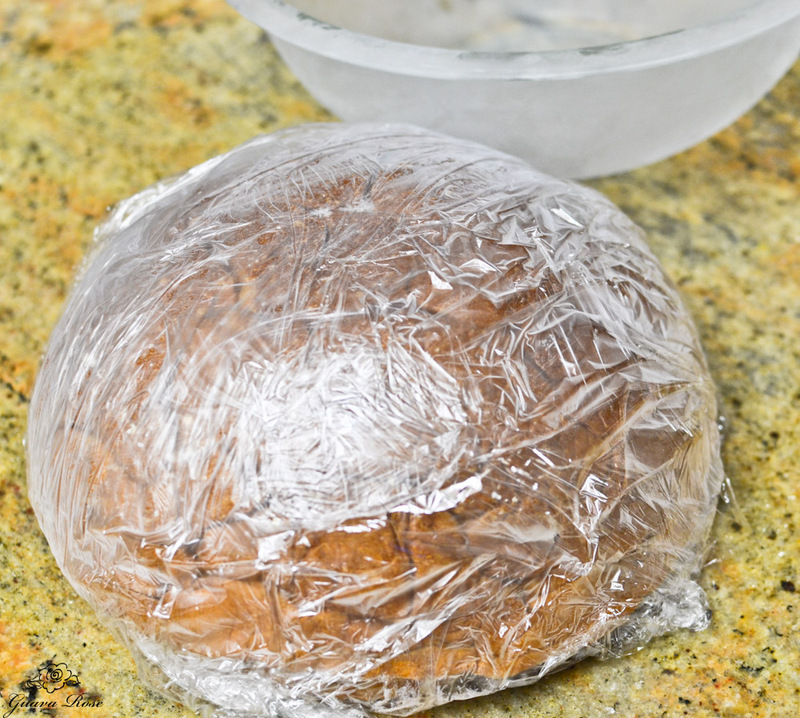 Cover up any leftovers on the plate tightly back in the plastic wrap, or place individual pieces in ziplock baggies. The pieces keep well in the freezer. Previous postThe Great Dickens Christmas Fair (Part 3): Tasty Bites Next postHappy Holidays!